Ozhotels is a group of independently owned and non-related hotels, resorts and serviced apartments situated in the holiday destination of Coolum on the Queensland Sunshine Coast. Ozhotels allows you to deal directly with the apartments and resorts, therefore giving you the best possible rates for this Coolum accommodation. 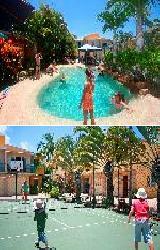 So book your next resort or apartment holiday accommodation in Coolum online and get great discount rates. 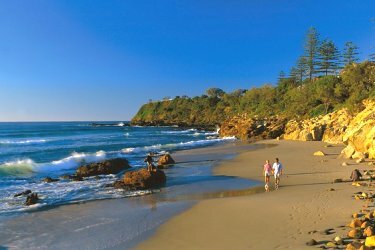 The region of Coolum on the Queensland Sunshine Coast is a delightful place that is filled with all sorts of places to stay, ranging from fully self contained holiday apartments and resorts right through to luxury hotels and budget motels. This wide variety of Coolum accommodation is what makes finding the right place for your next holiday a difficult and time consuming task. This is why many people like to use the free services of an accommodation expert like OzHotels in order to help them find the perfect place. This sevice allows you to compare hundreds of different properties that are situated all over Coolum, in order to find the one that meets your specific needs and travel budget. The main benefit of using OzHotels to book online is that you can book your travel up to 12 months in advance and that you will be able to get an extra discount off the already cheap rates the longer that you holiday in Coolum. The spacious and comfortable apartment accommodation at the Element on Coolum Beach is truly remarkable and has been architecturally designed to accommodate the needs of the discerning holiday traveller. 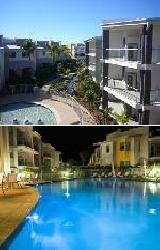 Element on Coolum Beach combines the best of urban chic design and wonderful beachside living. This Sunshine Coast resort features 49 luxury one, two and three bedroom apartments and sub penthouses, all of which have been luxuriously appointed and have spacious private balconies. The Element on Coolum Beach features beautiful landscaping with cascading water features, reflective pools, a heated outdoor swimming pool with sun lounge area and BBQ facilities. At the Element on Coolum Beach there is also 9 specialty stores including restaurants and cafes on the premises which helps to make this the perfect Coolum accommodation for your next Queensland holiday. 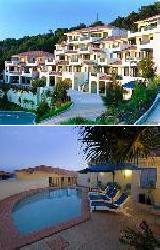 For more Coolum Apartments click here. 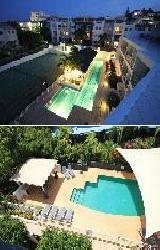 The Beach Retreat Apartments are ideally situated in the heart of Coolum Beach on the Queensland Sunshine Coast. The Beach Retreat Resort Coolum is a 4 star property that has been stylishly appointed with a range a furnishings and amenities that complement the relaxed tropical surroundings. The budget Coolum accommodation provides by the Beach Retreat consists of a selection of studio, one and two bedroom fully self contained apartments which are perfect for the leisure guest. The Beach Retreat Apartments Coolum offers all the recreational facilities that you would expect from a luxury resort including a heated outdoor swimming pool, a choice of spas, sauna, children's wading pool, games room, onsite restaurant and bar. The Point Coolum Beach provides excellent value for money accommodation in a range of 1, 2 & 3 bedroom villa apartments, all with panoramic ocean views. The Point Coolum Beach is located on the spectacular Point Arkwright at Coolum Beach in the heart of the Sunshine Coast and is a short walk from secluded bays and a 5 minute drive from Coolum Beach. The Point Deluxe Holiday Villas Coolum Beach within easy reach of golf courses and a short stroll to Coolum Village shopping and dining. The Point Coolum Beach in Coolum is close to everything that the region has to offer, as well as having a numerous guests facilities and services including direct internet access, free car parking, spa, outdoor swimming pool, tour desk, bbq facilities, landscaped garden, airport shuttle and baby cots available. The property is just 200 metres from beautiful "secluded" bays and is around the corner from the main Coolum surf beach. The 1, 2 & 3 bedroom self contained serviced villa apartments at the Coolum Beach Getaway Resort are perfectly situated only 200 metres from the patrolled Coolum Beach on the magnificent Sunshine Coast. The Coolum Beach Getaway Resort is a family friendly resort, designed for for families, couples or groups at affordable rates, for that relaxing holiday or last minute Sunshine Coast visit. The Coolum Beach Getaway Resort in Coolum is close to everything that the city has to offer, as well as having a numerous guests facilities and services including free car parking, spa, outdoor swimming pool, tennis court, tour desk, bbq and baby cots available. The Coolum Beach Getaway Resort also provides a range of business facilities including free wifi internet access, faxing facilities and a photocopying service. The Coolum Seaside Apartments provides the discerning holiday traveller with a wide selection of luxury 5 star studio, 1, 2 & 3 bedroom self contained serviced apartments & townhouses that are ideally located only 100 metres from the beautiful, patrolled Coolum Beach. The Coolum Seaside Apartments Resort is perfectly positioned to take full advantage of the Sunshine Coast natural scenic beauty and holiday attractions. 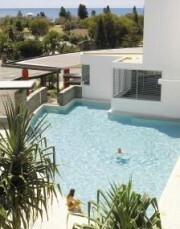 The Coolum Seaside Apartments in Coolum is close to everything that the entire region has to offer, as well as having a numerous guests facilities and services including direct internet access, disabled facilities, faxing facilities, free car parking, fitness equipment, lift, spa, outdoor swimming pool, tennis court, tour desk, bbq and garden area. The 1, 2, 3 & 4 bedroom apartment & villa resort accomodation on offer at the Coolum @ The Beach is perfectly situated in the heart of Coolum right next to Coolum beach. This delightful Coolum accommodation is also close to shops, cafes and 3 world class golf courses, making it the ideal holiday resort on the Sunshine Coast. The Coolum @ the Beach provides all types of travellers with discount accommodation in Coolum. It also features a wide range of modern amenities and services such as business centre, conference centre, internet access, faxing facilities, free car parking, fitness equipment, lift, secretarial services, outdoor swimming pool, tour desk, bbq and a landscaped garden. The Seachange Coolum Beach provides travellers with the choice of 1 & 2 bedroom self contained serviced Sunshine Coast apartments that are ideally located opposite Coolum's magnificent patrolled Surf Beach. Perfectly positioned on the David Low Way the Seachange Apartment Resort on Coolum Beach offers superb beach side holiday accommodation in a luxury resort setting. The Seachange Coolum is close to everything that the Sunshine Coast has to offer, as well as having a numerous guests facilities and services including direct internet access, free car parking, lift, secretarial services, spa, outdoor swimming pool, tour desk, bbq, garden, security and baby cots for hire. The Seachange Coolum Beach Apartment Resort provides you with that welcoming touch in a relaxed atmosphere.